By SHELLEY POWERS | The next time you sink you teeth into some calamari, think of this: The giant squid (Architeuthis dux) has been measured to a length of 60 feet (19.6m), and weighs in the neighborhood of between 1-2 tonnes. It has eight arms, each lined with two rows of suckers. The giant squid also has the largest eyes of any known creature, over a third of a metre in diameter. "Before my eyes was a horrible monster worthy to figure in the legends of the marvelous"
If the giant squid is like its smaller cousins, it is a predator. To make the giant squid an ideal predator, its suckers are ringed with a hard, jagged edge, resembling teeth, in order to better enable the squid to hold onto its prey. Additionally, two longer tentacles are also used to help catch and move the prey to the large, sharp parrot-like beak. So says the Naturalist, in the Jules Verne classic 20,000 Leagues Under the Sea. Though this book is a work of fiction, the squid encounter that Verne wrote about was based on fact, or at least a story that Verne heard about at the time. The story states that a French naval ship was attacked by a giant squid in 1861. 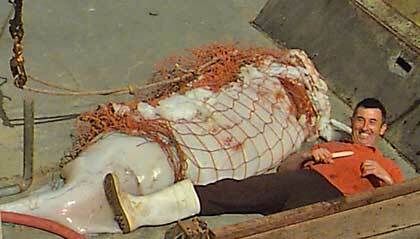 Another account of a giant squid attacking a ship is given in the logs of the Brunswick, a Norwegian trawler. In the logs an account is given of a giant squid attacking this large ship three different times, before the squid finally slid into the ship’s propellers and was killed. Amid rumor and scant eyewitness accounts, we have little knowledge of the giant squid and its behavior. Giant squid have been trawled or washed up on shore sporadically so we have had a chance to examine dead specimens. We also know that the giant squid forms part of the diet for toothed whales such as the sperm whale. Outside of that, though, we have little knowledge of these large invertebrates. We have never successfully viewed the giant squid in its natural environment, and we have never had a chance to examine a living specimen. But what we do know makes this an incredibly interesting creature. The first recorded physical record of the giant squid was made by a Reverend Moses Harvey in Newfoundland, based on a dead giant squid that had been caught by local fishermen. They had been washed up on shore before, but this was the first time a person had taken samples of the squid, and made scientific observations of the creature.